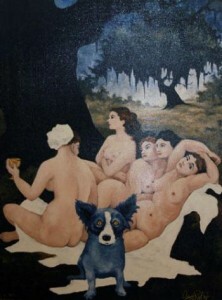 George Rodrigue’s Blue Dog is one of the defining elements of Louisiana’s artistic heritage. It’s hard to avoid seeing the wide-eyed blue canine somewhere in New Orleans, and many Americans were introduced to it in the early 1990’s when the dog’s pop culture status took off. Though Rodrigue’s death late last year left Louisiana without the creator of one of its most well-known cultural symbols, his dog lives on, more popular than ever before. The birth of Blue Dog came about, ironically, as a result of a death. 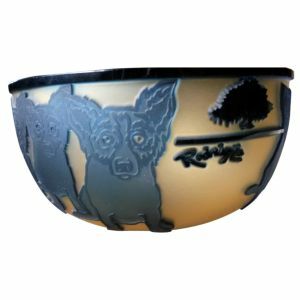 Rodrigue’s dog Tiffany died in 1984, and the artist decided to remember her by painting his first of the Blue Dog series, entitled Loup Garou. Loup Garou (also known as Rougarou) is actually a mythical werewolf creature with roots in Cajun mythology, said to stalk the swamps of southern Louisiana. Rodrigue continued to paint the blue dog in many of his paintings throughout the 1980’s, and by the end of the decade “it became a near-constant motif in the artist’s work,” according to the Times-Picayune. The dog gained national recognition when it was featured it advertising campaigns for Absolut vodka and Xerox in the early 90’s, and also began to be featured on posters for the New Orleans Jazz & Heritage Festival. The dog has not left the sights or hearts of Louisianans since, and continues to be an icon of the state’s artistic heritage. The two works pictured below are new Rodrigue offerings for sale. Barnett Fine Art is located in New Orleans, Louisiana. You can view a sample of the art and artists available by visiting our website. Several of the artists are local to the New Orleans area and they are extremely talented, creating exceptional artwork. As a private dealer, Patty Barnett of Barnett Fine Art can locate fine art limited edition works on paper and sculpture as well as original art. Additionally, our exclusive fine art consignment/resale service provides a platform to sell your artwork to support the diversity of your growing collection. This entry was posted on Thursday, August 14th, 2014	at 5:32 pm	and is filed under Consignment Services	. Both comments and pings are currently closed.